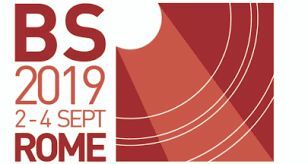 IBPSA is founded to advance and promote the science of building performance simulation in order to improve the design, construction, operation, and maintenance of new and existing buildings worldwide. The building industry, without a doubt, is one of the most important industrial and economical sectors influencing the quality of life and the environment. And yet, planners and property developers pay very little attention during the design process to the life-cycle cost of owning and operating buildings. Building Simulation offers the potential to cope adequately with building performance related concerns, as well as with the construction process. Increasingly, computer based models (programs) are being employed to aid in the design, operation, or management decision making process. The DEVELOPMENT, EVALUATION, USE IN PRACTICE, and STANDARDIZATION, of the models and programs in therefore of growing importance. For building Design, Construction, Operation, Maintenance and Management activities, there is also an urgent need for the INTEGRATION of “generally applicable” and “generally accepted” methods and tools, for various applications, each having various levels of complexity and/or various types of end-users. Also important is the TECHNOLOGY TRANSFER issue within the building modeling field. IBPSA will provide a framework for strategic alliances for information and cooperation in R&D and Technology Transfer. Promote the exchange of information on building performance simulation internationally and with other disciplines. IBPSA is an international organization with regional affiliate organizations around the world. Since the regional affiliate organizations often have names like “IBPSA-USA” and “IBPSA-France”, the parent organization is sometimes referred to as “IBPSA-World” to clearly distinguish it from the regional affiliates. 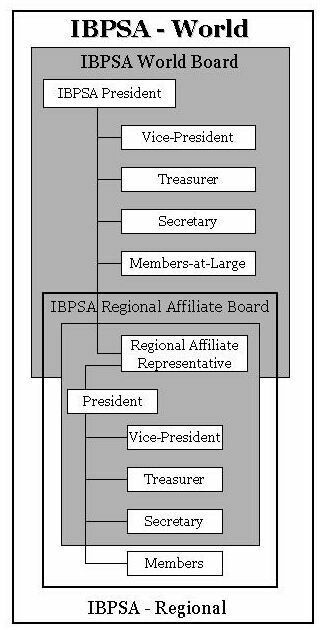 This chart shows how IBPSA is organized. IBPSA (IBPSA-World!) is governed by a board of directors elected by the membership of all the regional affiliates. In addition to the president, vice-president, secretary, and treasurer, the board is made up of members-at-large and representatives sent by the regional affiliates. Each regional affiliate will have their own governing board.